Paella is a traditional rice dish from the Valencia area, in the Eastern part of Spain, but it has become so popular you are likely to find it all over Spain, also along the Camino de Santiago, of course. Ingredients may vary. 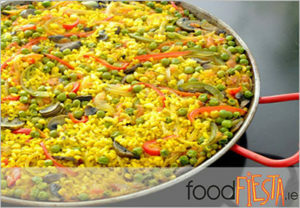 Our friends from Spanish food and catering specialist company FoodFiesta.ie have prepared this delicious Camino recipe: a vegetable paella, ‘paella de verduras’, with plenty of healthy flavours and ideal for vegetarians. *4 people / Prep time 45 minutes. 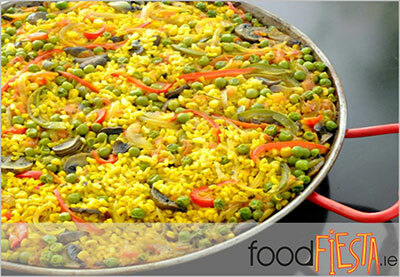 Cut the vegetables into julienne strips and slowly fry in the paella pan in hot olive oil. Meanwhile, in a separate frying pan, place a little olive oil and the paprika over a low heat. When the paprika starts to brighten up in colour, place the rice and the saffron into the pan and stir till the rice is nicely coated and infused with these flavour base tastes. Add the rice mix to the vegetables in the paella pan. Pour over the hot water/vegetable stock and add salt and allow to cook. Sprinkle with rosemary and thyme half way through. When the Bomba rice has absorbed almost all of the liquid, turn off heat and allow to rest, covered with a clean tea towel, for five minutes before serving. *If you would like more information about the Camino de Santiago, get in touch with our Camino travel specialists info@caminoways.com. Hi Gus, paella should be gluten-free, as the main ingredients are rice and vegetables (vegetarian option), in addition to seafood and/or meat (non-veggie option). You should always check with each restaurant however, in case they add any other ingredient that might contain gluten. I hope this helps! Buen Camino, Gus! I’m doing the Camino in two weeks and I need to know if paella is gluten free please.